When she was nineteen, my coach’s daughter left home to further her riding skills and experience, by working for a trainer in Germany for a year. All of the students left behind thought this was terrifically exciting and we vicariously enjoyed the adventure through hearing her reports whenever she would call home. Her mother was relaying one of these phone calls back to us, telling us that her daughter was having a great time, was riding all sorts of top-trained horses, and felt she was well on her way, in fact, to unlocking the mystery of the perfect half-pass. We all hung on every word with bated breath, waiting to hear the great mystery de-mystified! “Well, what she has figured out is… it’s all in the outside rein”. Everyone exhaled suddenly and drooped our shoulders as if we were balloons that had been pricked with pins. We already KNEW that the “secret of dressage is in in the outside rein”! That didn’t mean we truly understood it though. If you, yourself, have ever wondered why, oh why, is the outside rein so important in all types of riding and driving, when executing circles, turns, and any movement involving bend or sideways motion, I have an analogy I want to share. With this image in mind, the why and the how of the outside aids becomes more clear. Imagine the energy of your horse as a stream of water, flowing forward. 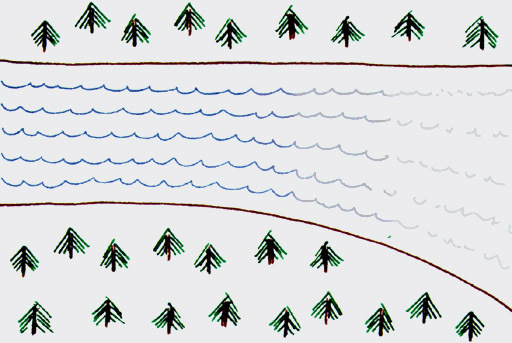 The water is contained between the left and right banks of the stream, which are your left leg and left rein, and your right leg and right rein. Now, say we want to redirect the stream, and have the water flow to the right instead of going straight ahead. How do we accomplish that? 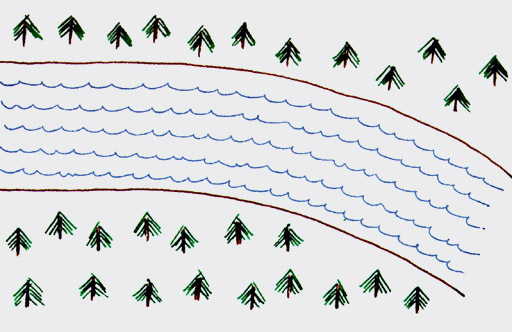 Well, if we just take and move the right bank of the stream right-wards, what will happen? The water would just kind of spread out and dissipate, but the stream wouldn’t really move to the right, would it? In order to move the stream right, we need to take and move both banks to the right. 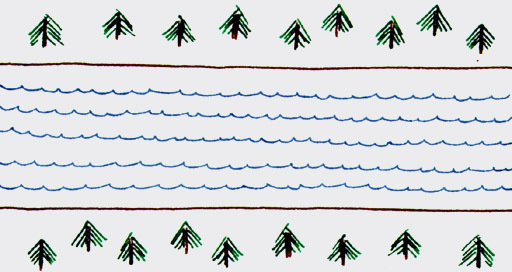 If we do that, the water will come merrily forward and find both stream banks are moved to the right, and so the water will go right as well. But into which bank will the water push with more force? The outside, or left bank in this case, won’t it? That explains why in a circle or turn, we need to have a firmer contact with our outside rein, and have the support of our outside leg to shore up the outside bank of the stream to keep the force of that water contained. The inside rein will be there as the inside bank of the stream, providing structure but in a light, playful way. The energy of the water is the forward energy of your horse, which comes from his hindquarters, and is initiated by his desire to go forward activated by your inside leg. So your inside calf will activate the hind end and push the water forward to be shaped and contained on the circle by the outside rein. When the force of the water hits the outside bank of the stream, depending on how much we’ve turned the bank, you would expect the water to lose some forward momentum, wouldn’t you? So, if you don’t want to have a loss of forwardness, you will need to periodically add an impulse of energy from your inside leg. But you can also use this awareness in the case when you do want to the horse to wait and cover less ground forward. Then you can use that turning effect on the circle to contain his energy, or even add a half-halt on the outside rein to bring him back more. And that is why the outside rein is always your turning, connecting, and half-halting rein! Credit: Illustrations in this article done by Stefan, using some of his fountain pen collection. Lori – thank you for the stream analogy/visual! Really helps me understand the concepts Much better! You are a poet and have a wonderful way with words! I was sitting on the edge of my seat this time, wanting to know what the young girl learned. I knew the answer, but I loved the way you explained it. And now, when I use this picture to explain it to my young 15 year old daughter, she will understand, and hopefully put it into practice. Hi Lori, what a timely illustration of the outside rein – inside leg concept. I have a 5 year old fjord, who we ‘rescued’ 3 years ago from a not so ideal situation. We are overcoming his issues (a recent one was that he bucked me off at the canter), and a dressage rider is helping me put a solid riding foundation on him, so that I can continue his training. After years of ‘just’ trail riding I am re-discovering (or may be really understanding for the first time???) 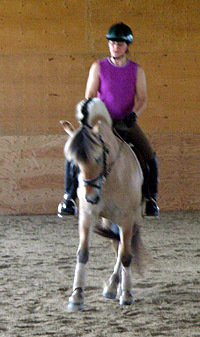 some of the principles of dressage. The stream image will stay in my mind. I am curious about another topic: recently you where talking about your horses being out in pasture, and I am wondering how you manage pasture time for these easy keepers. I am always very cautious when it comes to giving access to pasture. I love your articles and look forward to each one of them. I LOVE this analogy. Lori – you know I struggled with this 🙂 Sometimes all the words in the world don’t help me. I “get it” but all the verbal theory doesn’t get “from the brain to the rein”….and then…a simple picture is all it takes!! Thanks!! Hey everyone! I am so glad to hear that you got an a-ha! from my analogy. I am always on the lookout for these visuals that will shortcut the learning process for me. Thanks for letting me know it helped. About the Fjords on pasture, I have a number of dry paddocks with gates that let out onto pretty big and nice grassy pastures. I will open the gates and let them out at say 6:30 am and call them back at 11:30 am. They mostly come when I call because they are actually full of grass (but would never admit that!) Depending on the needs of the horse I may put them back on grass again from 5:00 pm to 8:00 pm, or if not, they get two feedings of hay in the pm. This is a brilliant image, and one I will keep with me and recall often as I hear my instructor say “OUTSIDE REIN” repeatedly! Not only are you a gifted horsewoman, you are also a gifted wordsmith and so generous to share your insights with the rest of us! I have also really appreciated your suggestions on bodywork for riders. As a 50-something rider it’s so vital for me to become smarter about using my body correctly. You did a wonderful job both in breaking this down, with a illustration to help one understand this…and to take one step further…I use this with driving…BUT…no leg, I use my whip where I would place my leg when riding…. A lot of the riding skills are the same skills one uses in driving, but we use our whip to replace our legs….half halts, outside/inside rein all the same, timing, cadence…all the same.. This is explained so wonderfully!!! This is a brilliant concept, and put in such an easily understood manner. Now, every time I want to turn, or half-halt, or do anything really, I just say to myself “Think of the stream,” and the images pop into my head. In just a few rides on my Welsh Cob I’m seeing the difference. Would you mind very much if I had your post printed to put on the noticeboard of our riding club in Cygnet, Tasmania, please, for all our members to study?